18th United States President, Civil War Union Lieutenant General. He was born in Point Pleasant, Ohio. 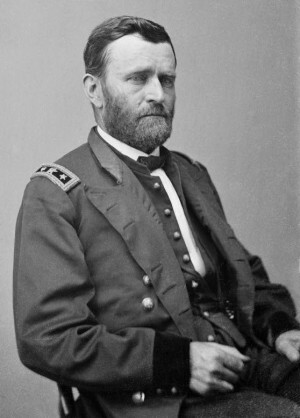 His birth name was Hiram Ulysses Grant. At seventeen, he entered the United States Military Academy at West Point. After graduation, his first assignment was service in a border war with Mexico. After eleven years he resigned his commission and persued a number of failed civilian endeavors. He answered the call for service during the Civil War, quickly rising to rank of Brigadier General. Victories at Fort Henry, Fort Doneson and Vicksburg earned him a second star. After raising the siege of Chattanooga, Grant was promoted to Lieutenant General and placed in command of all Union armies. The Army of the Potomac under General Grant finally forced Robert E. Lee’s Army of Northern Virginia to withdraw from Richmond the following spring and finally surrender on April 9, 1865. The following year Congress awarded a fourth star, making him the first full General of the Armies in American history. With his popularity at an all time high, he accepted the Republican nomination for President of the United States in 1868. After serving two terms in the White House, Grant entered business on Wall Street in New York City. He lost all his money. To help support himself, he wrote magazine articles about his military life. He was ill. He displayed the first symptoms of Throat Cancer in the summer of 1884. The General always displayed an excessive use of tobacco. A cigar in his mouth was his trademark. On June 16, 1884, suffering from extreme discomfort from his cancer, it was decided to accept an offer from a wealthy friend to go to Mount McGregor, New York, a mineral springs resort and stay in a small cottage which he owned. 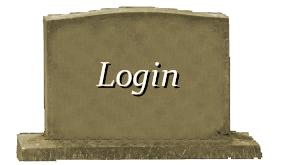 Here he awaited death while writing a book about his life. He died here in the front room of the little cottage where he had been bedridden. An embalmer was summoned to prepare the remains. 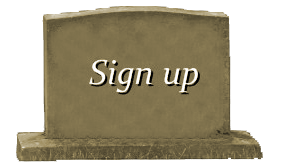 While deciding a burial place, his body was placed in a casket and left in the middle of the room where it was viewed by an estimated three hundred people over a period of weeks until a park on Riverside Drive was selected and a temporary vault was constructed. General Grants body was placed on a train and taken to New York City. On August 8th, his funeral procession stretched for seven miles through the streets of New York City to Riverside Park located on the Hudson River. President Grover Cleveland led some 60,000 marchers while a million people lined the route. Both union and Confederate generals acted as his pall bearers. Grants wife, Julia so devastated by his death was unable to attend the funeral. Contribution from around the nation raised enough money to construct the present day tomb. Finally on April 27, 1897, with Mrs. Grant present, it was dedicated after a parade witnessed by over a million people. Upon Mrs. 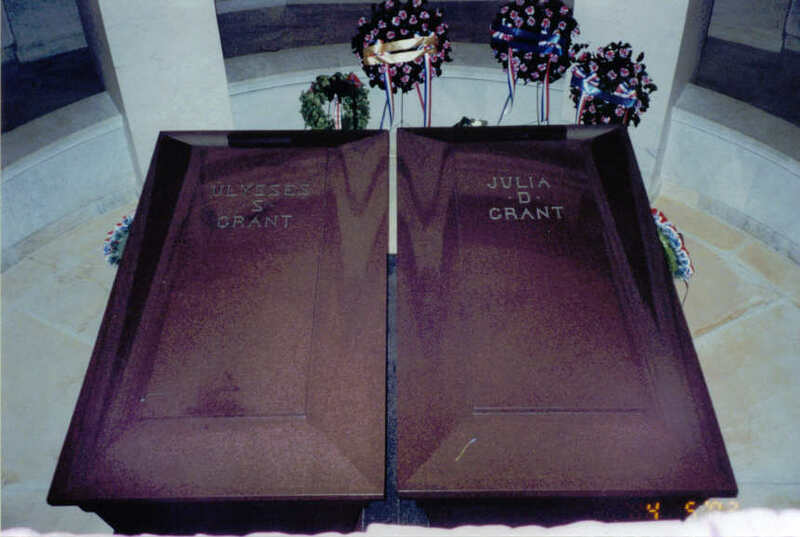 Grants Death in 1902, she was interred beside her husband.